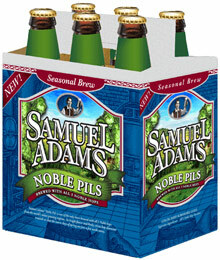 Sam Adams finally comes through with its Noble Pils, and that makes Mike very happy. Although they are now this close to being a full fledged macro brewer (if they aren’t already – it’s just semantics), Sam Adams continues to put out quality beer. They have successfully proven that it is not necessary to dumb down the flavors to win over American beer drinkers. They have also filled a niche by brewing true-to-style beers that aren’t so insecure that they need to go horribly over the top like so many of today’s micros. Their new seasonal, Noble Pils, is a great addition to their lineup, a style that is absurdly nearly ignored on these shores. As you’ll hear from any Czech, real pilsners are nothing like the ones that call themselves that in the States. It’s not just the water, either. A Budweiser is to a pilsner as the Geiko lizard is to a dragon. Except real pilsners do exist – somewhere. The Sam Adams is a true pilsner. I’ve had fresh-from-the-source pilsners in Prague that were no better. And, even when you can find them here, it’s next to impossible to find a fresh one. Freshness is vital to a good pilsner. They aren’t meant to age on dusty import shelves, like some ales can. Check out the rest of the review for Mike’s full take.